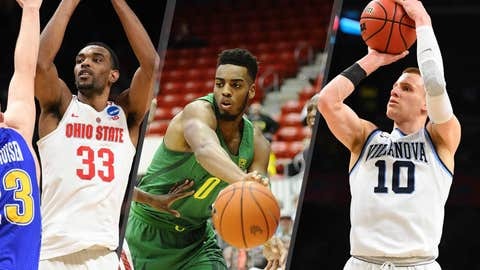 Well, the NBA draft is now upon us and we’ll soon find out who the Minnesota Timberwolves will select with the No. 20 overall pick. The last time we took a look around the web at mock drafts, guard was a favorite position from prognosticators when predicting the Wolves’ pick. Not much has changed in a month as far as position — guard is still the popular choice, although the names have changed a bit, with two players being mocked to Minnesota more than others. That doesn’t mean a forward isn’t being mocked to the Wolves, there’s a few of those as well. In fact, in the mocks we searched 13 different players were projected to Minnesota. (Note at the end of this article you can see a final tally of selections). So who will have it right? Check the mocks below and come back after Minnesota picks. One thing we can guarantee — plenty of people will be wrong. Tommy Beer of Forbes: Keita Bates-Diop, F, Ohio State. Basketball Insiders: Of their four prognosticators, two have Minnesota selecting Donte DiVinceno (SG, Villanova), another has Khryi Thomas (SG, Creighton) being the pick and Jerome Robinson (SG, Boston College) is the other prediction. Mike Sorensen of the Deseret News: Troy Brown, G/F, Oregon. Fred Katz and Tom Westerholm of masslive.com: Colin Sexton, PG, Alabama. Al Iannazzone of Newsday: Donte DiVincenzo, SG, Villanova. Brad Rowland of Uproxx: Jacob Evans, SG/SF, Cincinnati.